Virginia Secretary of Commerce and Trade Maurice A. Jones visited Tidewater Community College on Friday for a briefing on how the college, as a regional leader and economic driver for Hampton Roads, is matching employer needs with relevant professional credentials in preparation for a competitive workforce. President Edna V. Baehre-Kolovani’s 90-minute presentation at the Advanced Technology Center on the Virginia Beach Campus highlighted TCC’s priorities as they relate to current and recent graduates, incumbent workers seeking to upgrade their skills to keep pace with an evolving work environment, and career switchers, including displaced workers and veterans transitioning from active duty to civilian life. Among the career pathways discussed: TCC’s proposed dual-enrollment program in mechatronics, which will allow students to earn their high school diploma while preparing for in-demand jobs in advanced manufacturing. An additional year of study at TCC will lead to an associate degree. 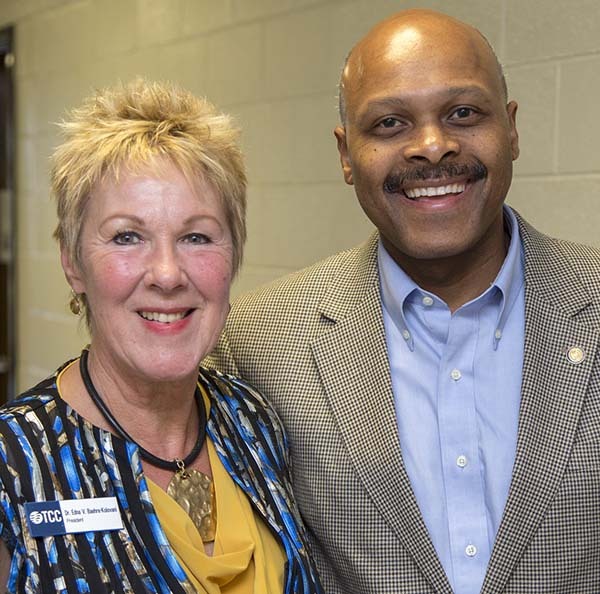 “We’re fulfilling a workforce need in a high-growth, high wage-area, and we’ve created a seamless career pathway to do it,” said Lisa Rhine, provost of the Chesapeake Campus. Baehre-Kolovani noted the success of TCC’s Southeast Maritime and Transportation (SMART) Center, which focuses on increasing the number of well-qualified, skilled technicians in the maritime and transportation industries. Through established career pathways, students move from the college to an industry apprenticeship to a journeyman’s card. Industry credentials can progressively lead to an associate degree and even a bachelor’s degree. Daniel DeMarte, vice president for Academic Affairs and chief academic officer, closed the presentation with the success of the Z-Degree, which allows students to earn an Associate of Science in Business Administration without paying a cent for textbooks. TCC is the first regionally accredited institution in the United States to offer a degree in which students rely solely on open educational resources, which are freely accessible, openly licensed materials helpful for teaching, learning, assessment and research. “We had 1,000 students in our first cohort, and we estimate that’s a savings of $165,000,” DeMarte said. 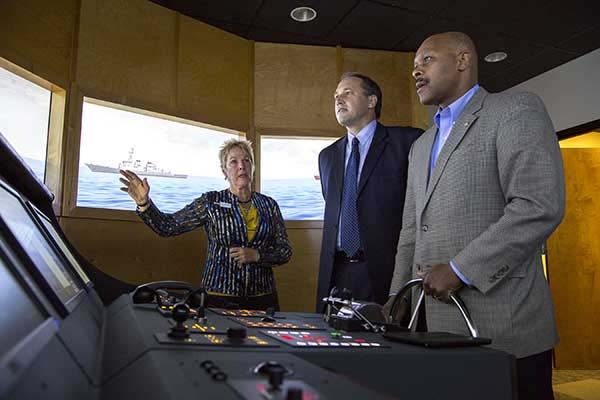 The secretary’s visit ended at the Lynnhaven Building, where he steered a ship through rough waters courtesy of the college’s maritime simulator. “Did we wow you?” Baehre-Kolovani asked Jones as he departed. Gov. Terry McAuliffe appointed Jones, former publisher of The Virginian-Pilot, to the post of secretary of commerce and trade in January. He received the TCC’s Martin Luther King Jr. Distinguished Community Service Award in 2012, and plans to return in December to speak at the Fall 2014 Commencement.